Bond Economics: Is 100% Reserve Banking Feasible? Is 100% Reserve Banking Feasible? The Icelandic Sovereign Money System Proposal has increased interest in the possibility of 100% reserve banking. I am quite skeptical about 100% reserve banking, and prefer the Canadian 0% reserve system. That said, I have not looked too deeply at the details of various 100% bank reserve systems, such as the Icelandic proposal. In this article, I will outline what I see as potential problems with such a system. The banking system is broken into two components, the safe part that takes deposits (which is "bank money"), and the other component which undertakes lending to the private sector. The lending component cannot take deposits, lending is either funded with term deposits or equity. Monetary Reform: A Better Monetary System for Iceland (pdf). positivemoney.org (U.K.-based organisation, but has 17 sister organisations). Ralph Musgrave's web site which has a link to the pdf of his book The Solution is Full Reserve/100% Reserve Banking (also available in paperback). The following articles from supporters of Modern Monetary Theory point out flaws with 100% reserve banking. Bill Mitchell, Iceland's Sovereign Money Proposal - Part 1, and Part 2. Neil Wilson, The Sovereign Money Illusion. I have not had time to study these proposals in detail. I doubt that I would have conclusions much different than Bill Mitchell and Neil Wilson, but I want to keep an open mind on the topic. The rest of this article are high-level issues that I see with the concept, but it may be that these issues are accounted for within these suggested frameworks. As I explain in the next section, the only way a 100% reserve banking system would make any difference is that non-bank finance ("the shadow banking system") would have to be basically eliminated (other than equity financing). From what I have seen of these proposals, they have long complaints about the creation of money by banks, but tend to be silent on non-bank finance. If it was possible to clamp down on bank and non-bank finance, the "financial accelerator" within monetary capitalism would cease to exist. I follow the business cycle views of Hyman Minsky, and it is very clear that debt-financed speculative financing of fixed investment is a major source of economic instability. Since fixed investment is a major source of business sector profits (from the Kalecki Equation), it creates a self-fulfilling upward boom in the economy. Anything that clamps down on that positive feedback loop would stabilise the economy. Since anything would do the job, the safest approach is to reform the existing system along lines of historical experience, rather than creating a completely untested system.In some cases, radical reforms are needed because there are no historical precedents to provide guidance, but in this case, we have the lessons of the 1950s to examine. If the non-bank financial sector is allowed to continue operating in a fashion similar to the current environment, it will push the hobbled banking system pretty much out of existence. The banks would have a regulatory and capital burden that would make them completely non-competitive. The fact that deposits are "sticky" is one of the factors that makes the formal banking system relatively stable. This is implicitly recognised in credit analysis as well as regulatory norms. Being unable to use deposits to finance the banking system eliminates one important stabilising force. The British North American colonies (which later merged to form Canada in 1867) were somewhat indifferently managed from London. For most of the colonies, there was a continuous shortage of copper money (pennies and half-pennies) which was needed for commerce, and the colonial administrators did little to alleviate this shortage. The private sector took matters into its own hands, and issued copper tokens. 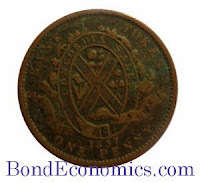 In Lower Canada (which became Québec) had particularly acute shortages, and the quality of tokens declined. In 1837, the banks stopped accepting other tokens (except by weight) and they replaced them with their own tokens. 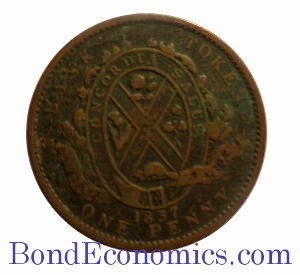 The pictured token on the left is an example, the Québec Bank One Penny/Deux sous "Habitant" bank token*. The banks were literally printing money (or at least tokens), but this was welcomed as it replaced even more dubious forms of money. This process of the creation of new forms of money is inevitable. If the government attempts to clamp down on the financial sector, non-financial firms will find means to create money substitutes in order to grease the wheels of commerce. This process of new money creation will be popular and will be allowed to continue. Although someone who inherits wealth can preserve some of it by hoarding money or gold, the reality is that you can only build up riches by pursuing commerce. These rising stars will bend the political environment in such a fashion so as to allow businesses to thrive. Therefore, no matter what rules are on the books, the private sector will find a way to create money, and politicians will ratify those new forms of money during a crisis. We already have instruments that act pretty much like 100% reserve banking - Treasury bill money market funds. And for some purposes, they are quite useful. But the reality is that the market share of such funds is not particularly large. The "revealed preference" of investors is that they would rather take risk to earn a small yield spread over the Treasury bill rate. Whether or not this is a good idea is irrelevant; the reality is that any reforms would be fighting against this economic force. If We Abolish The Non-Bank Financial Sector, Where Do Existing Assets Go? There is a good reason why the non-bank financial sector has grown so much: it matches the growth of financial assets. The increase in wealth in the middle classes has shown up in pension fund and insurance company financial assets. We have a created a policy environment that favours the build up of these stocks of financial assets. These assets have to be invested somewhere, and the reality is that these investors have liabilities that can only be matched to fixed income assets. If the non-bank financial sector disappears (outside of government bonds), this creates a serious problem for these entities. Any reforms along these lines would also have to rebuild the entire pension system. I find the belief that the government will not bail out the non-guaranteed portion of the banking system to be quite amusing. We have decades of experience that shows that governments almost invariably swoop in to bail out the financial system rather than suffer a depression. The latest example during the Financial Crisis was when the U.S. government guaranteed money market funds, which were always marketed as being without a guarantee akin to deposit insurance. * The habitant is the person on the front side of this token (not shown); this word is the source of the chant "Go Habs Go!" one hears at Montréal Canadians games. First you say “I have not had time to study these proposals in detail”, and then say that the proposals are “curiously silent” about shadow banks. If you actually read my work (“The solution is full reserve…”), or just word searched for “shadow bank” you’d find the problem of shadow banks fully addressed. Basically my view on shadow banks is the same as that of the former head of the UK’s Financial Services Authority, Adair Turner, namely that shadow banks should be regulated in exactly the same way as regular banks, with the possible exception of the smallest shadow banks. Failing to regulate an entity which is actually a bank but won’t admit to being a bank is a bit like failing to imprison bank robbers who won’t admit to being bank robbers: daft. Re your claim that 100% reserve requires the “elimination” of shadow banks, I’m baffled. Why? A shadow bank is simply an entity which is normally small compared to the J.P.Morgans of the world, and which offers a small range of services relative to the JPMs. There is absolutely no need to eliminate those small entities. Someone who lends $10 to their next door neighbour acts as a bank. I don’t believe in making $10 loans illegal. Well obviously if there were a serious shortage of money then the private sector would start issuing its own money. But under 100% reserves the state aims to issue enough money to give us full employment and “grease the wheels of commerce”. And if any private bank is found to be getting in on the money printing business, it’s executives get arrested just like back street counterfeiters get arrested. Next you say “The "revealed preference" of investors is that they would rather take risk to earn a small yield spread over the Treasury bill rate.” What risk? People who deposit money in banks under the existing system DO NOT TAKE A RISK!!!!! The risk is carried by taxpayers or largely by taxpayers!!! That’s the whole point. The existing bank system enables depositors to reap the benefits of having their money loaned on, while someone else carries the risk. Why should taxpayers have to subsidise people with loads of money in the bank? Finally, you say “I find the belief that the government will not bail out the non-guaranteed portion of the banking system to be quite amusing.” What makes you think it will ever ACTUALLY NEED bailing out? If that portion of the bank system is funded just by equity (as proposed by 100% reserve advocates Milton Friedman, Laurence Kotlikoff and John Cochrane) then it’s virtually impossible for it to go insolvent. Insolvency is an inability to pay creditors. An entity funded just by equity just doesn’t have any creditors (in the sense of owing any specific sum to anyone). "An entity funded just by equity just doesn’t have any creditors (in the sense of owing any specific sum to anyone)." Yes it does. Staff, trade creditors and the tax authorities. Cashflow kills and operations requiring large returns will go bust that much quicker if one of the assets fails to pay. Banks earn on the turn like any other business. And go bust like them. I did qualify the statement "from what I have seen"; unfortunately, I have not read your book (beyond the first 10 pages or so) nor the Icelandic document. (I have ordered the paperback version of your book, and I will probably read it on the beach this summer.) My statement was a bit harsh, so I dialed back the text a bit. I have read various articles by positivemoney.org, and by Kotlikoff and Cochrane. None of them addressed the shadow banking system in a fashion that satisfies me. "Basically my view on shadow banks is the same as that of the former head of the UK’s Financial Services Authority, Adair Turner, namely that shadow banks should be regulated in exactly the same way as regular banks, with the possible exception of the smallest shadow banks. Failing to regulate an entity which is actually a bank but won’t admit to being a bank is a bit like failing to imprison bank robbers who won’t admit to being bank robbers: daft." The problem is that without capital controls, the shadow banking system is international. As long as there is a regulatory race to the bottom (are the Tories about to tighten up on the City of London? ), nerfing your formal banking system so that financial activity migrates elsewhere is a very bad idea. "Next you say “The "revealed preference" of investors is that they would rather take risk to earn a small yield spread over the Treasury bill rate.” What risk? People who deposit money in banks under the existing system DO NOT TAKE A RISK!!!!! The risk is carried by taxpayers or largely by taxpayers!!! That’s the whole point. The existing bank system enables depositors to reap the benefits of having their money loaned on, while someone else carries the risk. Why should taxpayers have to subsidise people with loads of money in the bank?" During the crisis, none of the "formal banks" blew up, until the very end (Black Rock). The financial subsidiaries are what blew up, and they were not financed by deposits. What was costly to taxpayers was bailing out the bondholders who lent to the banks, not depositors. All of those bondholders had the option of lending to the government, but they chose to lend to those off balance sheet entities. "If that portion of the bank system is funded just by equity (as proposed by 100% reserve advocates Milton Friedman, Laurence Kotlikoff and John Cochrane) then it’s virtually impossible for it to go insolvent." Money market funds are 100% funded by unit holders. The unit holding is effectively an equity claim (the funds are technically trusts, so I am unsure about the exact legal/accounting terminology). Those funds were bailed out during the crisis. So I stand by my comment. It is always possible to structure "equity" to look like a debt obligation, and hence create a form of money. Once it becomes critical for the functioning of the economy, the new form of financing will be bailed out. 1. There are organisations in numerous countries pushing for full reserve. Thus ideally (from the point of view of FR advocates), several countries would implement it at once. 2. The same problem applies to all other forms of bank re-regulation. 3. The same problem applies to trying to get CO2 emissions reduced: i.e. if just one country cuts its CO2 emissions, it will pay a price for doing so, but reap very few benefits because other countries continue to pollute. That does not dent the enthusiasm of those pushing for emission reductions, and quite right. 4. Banks under full reserve are not subsidised, whereas under the existing system they are. If one country implements FR it will no doubt then find itself importing bank services. But if some other country wants to supply you with cut price bank services, cars or anything else, there’s much to be said for letting it. In particular, if a bank in some other country goes bust and taxpayers there bail it out, that’s not a big problem for the country which has implemented FR. Re your claim that “none of the "formal banks" blew up”, that’s because the Fed saved them. Where did the thirteen trillion dollars of public money go that was used to prop up the bank system? It didn’t go exclusively to shadow banks did it? I agree that a run on shadow banks was a big part of the crisis. FR solves that problem by regulating the larger shadow banks in the same way as regular banks. As to the smaller “back street” shadow banks, if most of those collapse, that shouldn’t be a systemic problem. Those sums owed to staff, trade creditors, etc are very small compared to the main items on a bank’s balance sheet. The main items are, as we all know, thus. Assets: loans and investments. Liabilities: deposits, bonds and shares (shares being a somewhat strange form of liability, of course). Also, in the case of small banks closed down by the FDIC, it’s common for it to turn out that a bank’s assets are 80 or 70% of book value. But for them to decline to zero is plain unheard of, far as I know. The worst case I know of was a bank in Chicago where assets fell to 10% of book value. So had that Chicago bank been funded just by shareholders (i.e. no depositors or bonds), then it wouldn’t have gone insolvent as long as amounts owed to staff and trade creditors didn’t amount to more than 10% of the book value of assets. Another problem arises with banks which incur HUGE liabilities in the form of clever clever derivative bets etc. But under full reserve (and indeed under the UK’s Vickers “ring fence” system) banks which specialise in clever clever stuff are kept separate from “boring” banks: i.e. the ones that just lend to mortgagors, small businesses, etc. If a small bank incurs liabilities ten times the book value of its shares and it goes bust (which would mean its clever clever creditors lose a fortune as well) then I’m not bothered, and nor would members of the Vickers commission be bothered. "Re your claim that “none of the "formal banks" blew up”, that’s because the Fed saved them. Where did the thirteen trillion dollars of public money go that was used to prop up the bank system? It didn’t go exclusively to shadow banks did it?" I think we agree that the regulatory environment going into the crisis was a shambles. I just fail to see how reserves fit into regulatory reform. I am not particularly concerned about the "subsidy" of deposit insurance; the "subsidy" the banks receive is balanced by the greater regulatory burden. Banking is not my area of knowledge, so I'm not going to say much other than any business can offer to sell on credit, effectively functioning as a bank. When I worked for a wholesaler that was how 90% of their business was conducted; only those with bad credit were required to pay cash. The company book keeper told me that they made more money from interest charges than on the actual sales. I have no idea how you would regulate that sort of thing? I do find the wording of this sentence a bit off: "The increase in wealth in the middle classes has shown up in pension fund and insurance company financial assets." Well maybe that is true in Canada but in the US the middle class is going extinct and only government employees get pensions (tho the private sector is given incentives to save in private retirement accounts). I would think the increase in financial assets has more to do with bubbles driven by the rich? Also driven by our trade deficit, as our trading partners prefer to save in dollars rather than spend dollars on American products. Yes, it would be extremely hard to regulate accounts payable/receivable. The British government was forced to devalue in the Bretton Woods era because of exporters and importers adjusting the length of payment time ("leads and lags"). This is despite the strong capital controls of the time. Canadian pension & insurance funds may be relatively larger, and probably have a higher percentage in debt securities in their portfolios. So yes, I may have been thinking a bit more about Canada. But even in the U.S., defined benefit pension assets are fairly large - but most are earmarked for people who are either retired or almost retired. (For example, the auto company insurance plans.) Thus they are not visible to those who are working. I use a wide definition of "middle class"; I would view an employee who builds up a 401k (an RRSP in Canada) as being middle class based on their income, but other people may consider that person rich based on asset holdings. And yes, the decision of foreign central banks to stockpile Treasurys has been a factor that builds up financial assets. I did not mention them, as they generally avoided lending money to "shadow banks". Looking through Zarlenga's stuff and the positive money site, I seem to be missing where interbank lending and repurchase agreements are explicitly banned. Where can I find this? That's precisely the problem. From what I have seen - and as I noted above, I have not yet read Ralph Musgrave's book - the existence of the non-bank financial system was ignored. Reforming the formal banking sector without looking at the interaction with the non-bank sector is not going to work. Ralph Musgrave has some comments about this issue above, and he would be much better placed to comment on how the proponents of 100% reserve banking would deal with the non-bank financial sector. I don’t think inter-bank loans would break the rules or spirit of full reserve. The only reservation there is as follows. Under most versions of FR, those who want their money loaned on to mortgagors, businesses etc actually CHOOSE the nature of the latter loans. E.g. they might opt for “strictly mortgages only” or “mortgages plus inter-bank loans” or “dodgy gold mines in South America” etc etc. In effect they buy into mutual funds. So inter-bank loans would be a BIT RESTRICTED under FR I think. I don't see how it can be said this proposed system can be made more safe if banks aren't banned from intertwined in each other's finances. If bank A takes a loan from bank B, and bank A has cash flow problems, this affects Bank B. Taking Minsky seriously means these kinds of leverage will only increase over time making and full reserve doesn't appear (in my opinion so far) to render the banking system any more resilient against cascade failure than the current system. Remember that under full reserve, the liabilities of banks come just in the form of shares, not debt (e.g. deposits, bonds, etc). So if bank A has problems, that means that the stake that bank B has in A will fall in value, and that in turn means the value of B’s shares fall in value, but it shouldn't result in either bank going insolvent.